Standing still is not in the DNA of Ajax Metal Forming Solutions, but continuous training and career building is. The Fridley, MN, supplier to heavy-equipment, durable-goods, architectural/construction and HVACR OEMs has undergone some big changes since 2011 when it was honored as a Metalforming Pioneer in workforce development. Then, E.J. 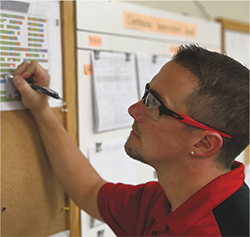 Ajax and Sons, Inc. and its 30 employees prided themselves as champions of manufacturing , with the need to promote the industry and make it as rewarding as possible for those who choose that path. As Ajax’ human resources and operations director, Curt Jasper, along with human resources administrative assistant Courtney Mickelson, leads the charge in recruiting and retaining talent, and helping that talent succeed personally and professionally. Today, the company boasts 70 employees and has doubled sales as well as square footage. And, as of last fall, it became Ajax Metal Forming Solutions through its acquisition by Heartland Equity Partners. As part of the sale, Kent Djubek continued as president of Ajax while increasing his ownership position, and Don Wellman, vice president of sales and marketing, also expanded his ownership stake. Erick and Tom Ajax, members of the family that founded the company in 1945, continue as equity owners and have joined the board of directors. At Ajax, as is typical throughout the industry, workforce development has become more challenging in the past few years. To meet that challenge, the company has undertaken a host of inhouse and partner programs, spearheaded by Curt Jasper, human resources and operations director. Right off the bat, potential employees are given a mechanical-aptitude test with only those testing above 70 percent given a follow-up interview. Training begins on day one of employment, with safety and other basic work topics covered via PMA’s OnboardingME training system, introduced in 2016. Within the first 90 days of employment, rather than focusing strictly on productivity, employees are closely monitored on safety and to make sure they ‘learn the ropes’ at Ajax. Tiffany Schluter formerly toiled in the retail world, but grew tired of that type of work. Joining Ajax, she took an M-Powered fast-track manufacturing-training course at nearby Hennepin Technical College, then was accepted into the company’s State of Minnesota-registered Journey Worker apprenticeship program. 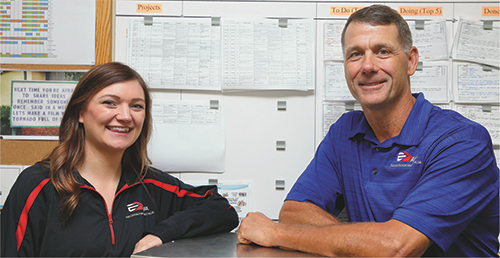 Completing the three-year program this past fall, Schluter, now a Class A machinist, is still taking classes, recognizing the benefits of continuing education. 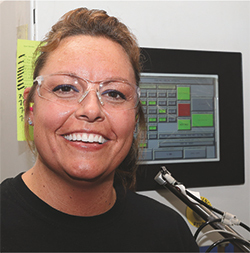 Running numerous machines on Ajax’ shop floor, she provides an ideal example of the company’s cross-training efforts and commitment to employee education and betterment. From there, training combines inhouse tracks as well as learning opportunities via outside sources. For the large majority of cross-training, Ajax teams up a trainee with a Class A operator, who helps to build the trainee’s skills to a proficient level on a particular operation. Nearly 11 years ago, Brandon Holmes began his Ajax career performing single-hit stamping, at the time a $10/hr. job. Looking to grow, he enrolled in the Hennepin Technical College M-Powerment fast-track manufacturing-training program and later would return to instruct some of those courses. He also attended Manufacturers Alliance lean-training courses. As time went on, Holmes transferred into Ajax’ fabrication department and participated in the Anoka Technical College sheetmetal program. He became well-versed in fabrication, learning to operate various machines as part of Ajax’ cross-training efforts. Holmes continued leadership training at Manufacturers Alliance after shifting to the company’s logistics team. He then would return to the shop floor as fabrication supervisor and assistant supervisor in press-room production. Eventually taking over as fabrication and production supervisor, within the last year Holmes has earned a promotion to plant manager. Along the way he also benefitted from University of Minnesota lean-management courses as well as Dale Carnegie courses. Most recently he earned Certified Professional Project Manager certification through the University of St. Thomas. Company officials recognize Holmes as a natural leader with a willingness to train others and pass along his knowledge and experience. Beyond inhouse efforts, Ajax receives support from local technical schools, including partnerships with Hennepin Technical College and Anoka Technical College, which provide entry-level manufacturing courses, and Manufacturers Alliance, a Minnesota peer-to-peer education and training resource. State-sanctioned apprenticeships provide another vital learning avenue, as Ajax currently has nine apprentices. Online college courses via Pine Technical & Community College and other schools also find heavy use as do Dale Carnegie courses. The company tries to make outside learning as convenient as possible via a well-equipped onsite learning center for webinars and online courses. By continually evolving its training programs and working closely with other institutions, Ajax Metal Forming Solutions has become well-known for developing and rewarding its workforce, and that is paying dividends in its efforts to recruit talent.